COLORADO SPRINGS -- The twice-a-year gathering of wealthy conservatives who back the Koch political network is not just a forum for political strategizing - it’s an event that seeks to identify libertarian solutions for some of the country’s most pressing policy fights. It was at one of these seminars in 2009 that donors committed to an intensive battle against Obamacare, an issue that engulfed the 2010 midterms. As top network officials and supporters met at a sumptuous mountain resort here this weekend, there was one dominant focus: the yawning gap between America’s privileged elite and working class. The preoccupation throughout the conference with a “two-tiered society,” as billionaire industrialist Charles Koch repeatedly described it, shows how the economic anxieties powering the campaigns of Donald Trump and Bernie Sanders have redefined the American political conversation. 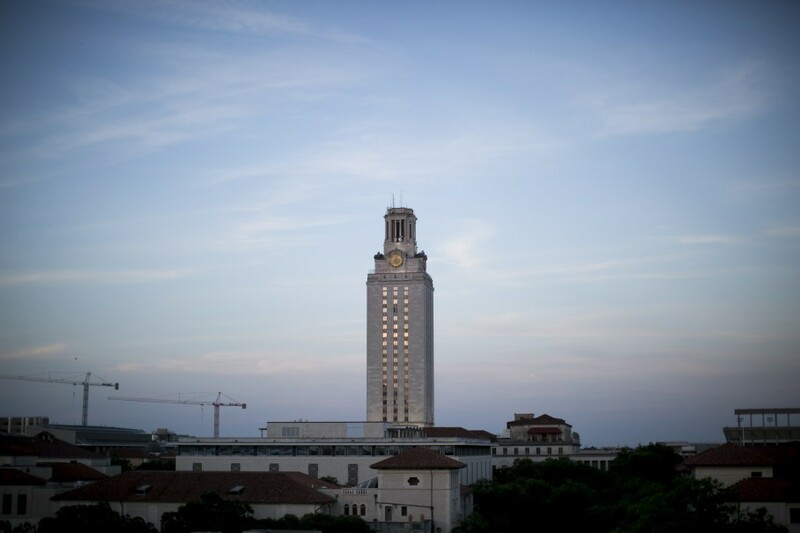 It’s a conversation that is bound to last far beyond Nov. 8 – and could be the driving force that shapes the policy battles of the next administration. Large banners hanging in ballrooms of The Broadmoor resort proclaimed the weekend’s theme, “A Brighter Future,” illustrated by a glowing metropolis rising out of a dark urban landscape. Koch said one of the network’s top priorities is providing equality of opportunity for those who feel left behind, adding that the organization was intensifying its investments to support communities, schools and the family structure. “Unless we make progress here in our culture, we are doomed to continue to lurch from one political crisis to another, and we will likely degenerate into socialism or corporatism, as two-tiered societies typically do,” he told attendees Sunday. 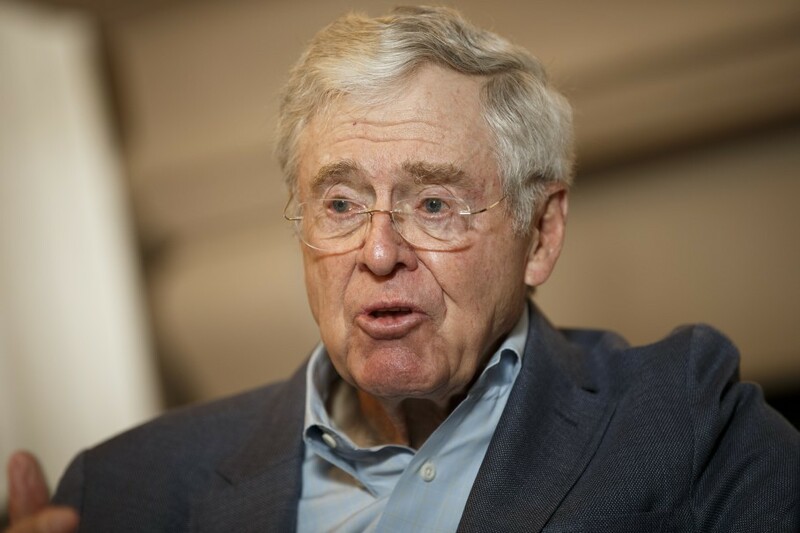 The intense focus by the Koch network on economic inequality is driven by a consuming worry that the 2016 campaign reflects a fundamental shift in American politics. “Love it or hate it, the rise of candidates such as Donald Trump and Bernie Sanders represent major movements in this country,” Brian Brenberg, a business and economics professor at The King’s College, warned donors on Sunday. To punctuate his point, Brenberg played video clips of voters in Florida and Virginia talking about how they feel the system is designed to benefit the wealthy at their expense. The attraction to candidates such as Trump and Sanders, Brenberg added, is driven by the real fears people have about their economic stability. Meanwhile, Charles Koch's refusal to back Trump's campaign is causing rifts with some of the group's biggest donors. My latest from Colorado Springs: "Between panels extolling free speech and conservative state-policy victories, Koch and his top deputies heard out donors worried about the network’s decision to sit on the sidelines. 'I told him that it was very important that Hillary Clinton not get elected,' said Minnesota media mogul Stanley Hubbard ... Koch’s decision not to embrace Trump threatens to alienate some heavyweight network backers who have rallied to the nominee’s side in recent months — mega-donors such as Wisconsin roofing billionaire Diane Hendricks, Oklahoma oilman Harold Hamm and New York hedge-fund magnate Mercer, none of whom attended this weekend’s conclave ... 'A lot of donors are saying, ‘Why are we spending money on Senate candidates and not trying to beat Hillary?’ said one well-connected Republican familiar with the views of major-party financiers, who requested anonymity to describe private conversations." In a closed-door meeting, Koch and senior network officials described their plan to attendees, explaining that the group's 700 donors are split over Trump, making it more strategically focus on Hillary Clinton in ads designed to improve Republican chances of retaining control of the Senate. And Charles Koch pushed back hard against the notion that he could come out and support Clinton, saying such a suggestion was "blood libel," comparable to false accusations throughout history that Jews killed Christian children for ritualistic purposes. With contributions from Breanne Deppisch ( @breanne_dep) and Elise Viebeck (@eliseviebeck) Sign up to receive the newsletter. Hillary Clinton received a four-point bump following a well-choreographed week in Philadelphia that saw heavy-hitters (the Obamas, Bill, Biden), pulling ahead of Trump 46 to 39 percent, according to a new CBS national poll. The race was tied last week after the Republican convention. Clinton received a four-point bounce since the Democratic National Convention, similar to those earned by Obama in 2012 and 2008, but short of the 13-point bounce her husband received in 1992. Trump, meanwhile, spiked by just two points after Cleveland. 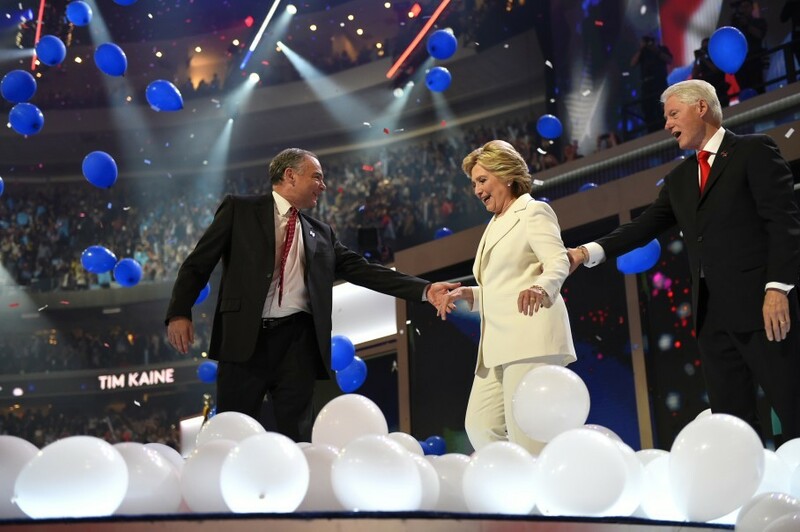 Positive views of the Democratic nominee have also spiked since the convention, from 31 percent a week ago to 36 percent today. Clinton's unfavorable numbers have dropped, meanwhile, from 56 percent to 50 percent. Voters remain firmly behind each candidate: Nine in ten Clinton AND Trump supporters now say their mind is made up. 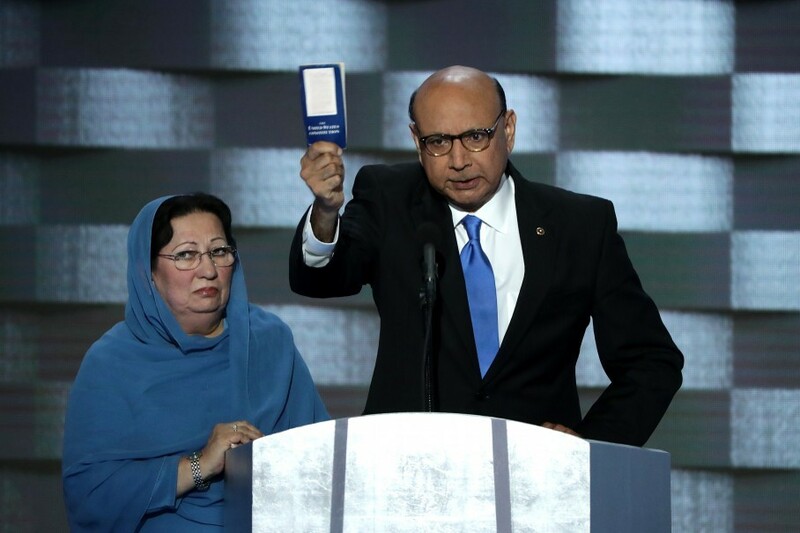 KHANS VS. TRUMP IS NEW FLASHPOINT IN CONTEST. HOW MUCH WILL IT MATTER? The confrontation between Donald Trump and the parents of a Muslim American soldier killed in Iraq continued to escalate Sunday, with Khizr Khan denouncing Trump as a “black soul” unfit for office in appearances on the morning talk shows in which he called for Mitch McConnell and Paul Ryan to repudiate the GOP nominee (they have not). The Donald found no good way to respond, tweeting Sunday morning that he was "viciously attacked" by Khan and trying to change the subject to radical Islamic terrorism. To ABC's George Stephanopoulus, Trump responded to Khan's comments that he had sacrificed nothing for his country. "Who wrote that? Did Hillary's script writers write it? "I think I've made a lot of sacrifices. I work very, very hard." Sen. Lindsey Graham also weighed in, saying “the phrase ‘unacceptable’ doesn’t even begin to describe” Trump’s comments towards the Khans. “This is going to a place where we’ve never gone before, to push back against the families of the fallen,” he added. The response from the Trump camp? Trump’s running mate Mike Pence defended Khan, calling him an “American hero” even as he blamed Clinton and President Obama for allowing the Middle East to be “overrun” by the Islamic State. 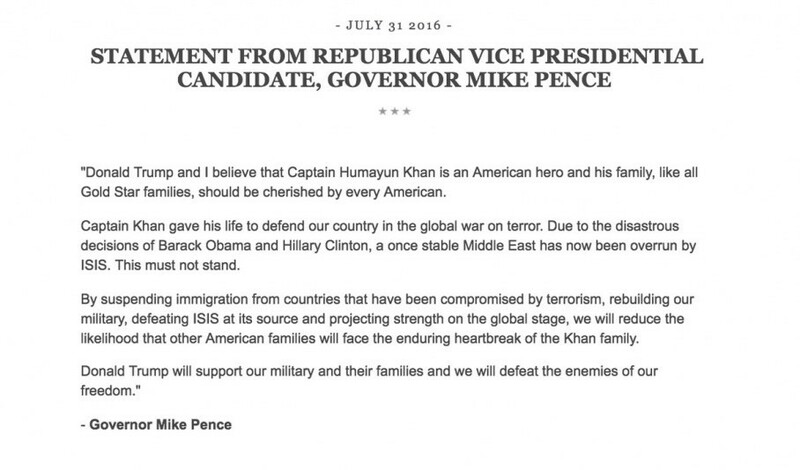 “Donald Trump and I believe that Captain Humayun Khan is an American hero and his family, like all Gold Star families, should be cherished by every American,” Pence said. And don't miss this piece from Rosalind S. Helderman about Trump's ties to Russia, following his call for the country to find Hillary Clinton's "missing" emails: "There is strong evidence that Trump’s businesses have received significant funding from Russian investors. Most notably, Trump’s son Donald Trump Jr. made that very claim at a real estate conference in New York in 2008, saying 'Russians make up a pretty disproportionate cross-section of a lot of our assets.” Donald Trump Jr. added, “we see a lot of money pouring in from Russia.' Trump also made millions when he agreed to bring the Miss Universe pageant to Moscow in 2013, a deal financed in part by the development company of a Russian billionaire Aras Agalarov. Agalarov is a Putin ally who is sometimes called the “Trump of Russia” because of his tendency to put his own name on his buildings. At the time, Trump mingled with the Russian business elite at a swanky after-party. “Almost all of the oligarchs were in the room,” Trump bragged on returning home." She also suggested Russian intelligence services hacked the DNC email database, questioning Trump’s support of Vladimir Putin. "We know that Russian intelligence services hacked into the DNC and we know that they arranged for a lot of those emails to be released and we know that Donald Trump has shown a very troubling willingness to back up Putin, to support Putin," Clinton said. -- Several big name Republicans have switched teams to vote for Clinton this year, The Fix’s Aaron Blake reports. Those on the list include Doug Elmets, a former Reagan administration official who spoke at the Democratic convention, as well as former Bush administration officials and members of previous GOP administrations. Check out the full list here. 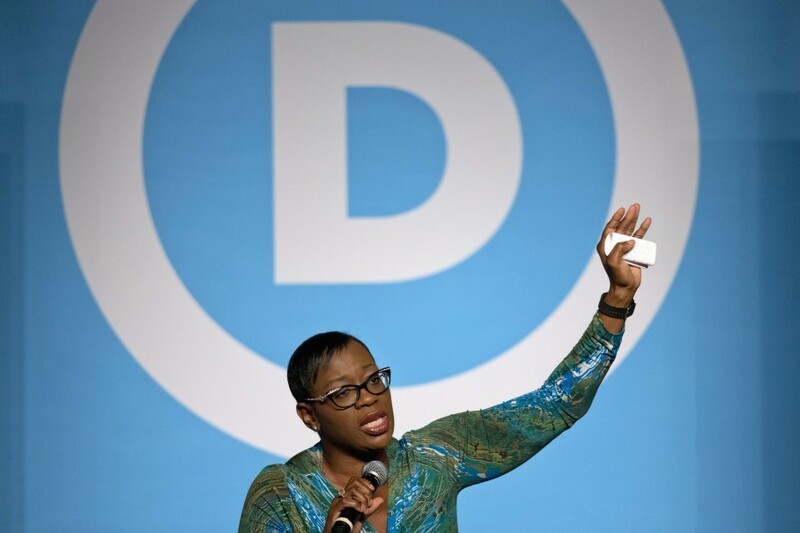 -- Sanders surrogate Nina Turner confirmed she has been offered a spot on the Green Party’s 2016 presidential ticket: "It's true," said the former Ohio state senator, confirming that presumptive Green Party presidential nominee Jill Stein had asked her to serve as her running mate. "Talking with my family … There's nothing to tell at this point." Turner, a former Clinton backer who eventually pivoted to become one of Sanders’ most vocal supporters, is seen by many as someone who could credibly criticize Clinton’s record on criminal justice reform. 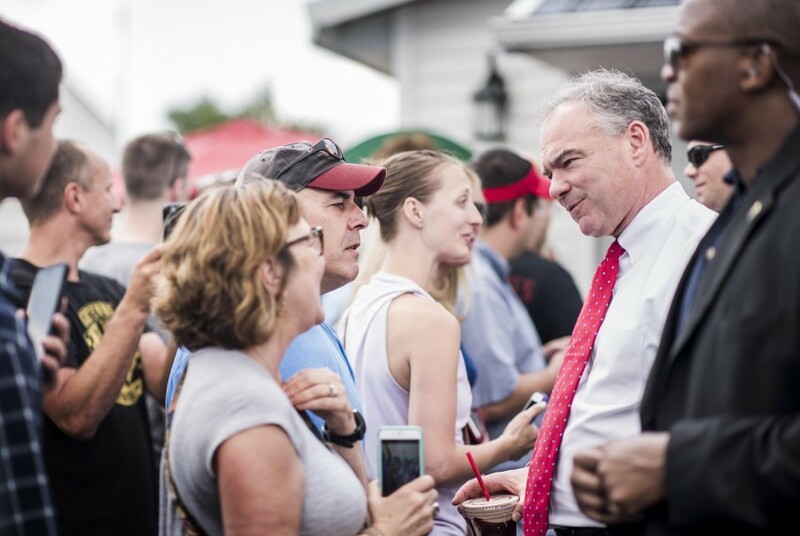 He also urged supporters to get away from so-called “personality conflicts” with Clinton, ticking off her position on Citizens United, raising taxes on the wealthy and increasing the minimum wage. When you focus on these issues, he said “the choice is pretty clear, and that is [Clinton] is far and away the superior candidate." No one should criticize grieving parents who have lost a son in combat. Capt. Khan was an American hero. This was Sunday's New York Post cover -- will Trump go after them? “Longtime Trump confidant smears Khan family as members of the Islamic Brotherhood,” From Raw Story: “While Vice Presidential candidate Mike Pence was posting a Facebook statement claiming Donald Trump “cherishes” the Khan family, a close confidant and advisor to Trump was calling the grieving father a ‘Muslim Brotherhood agent helping Hillary.’ The link Trump friend Roger Stone tweeted goes to a conspiracy theory website, that claims Khan’s son was killed before a secret mission was finished. ‘Is it likely that Khan’s son was killed before his Islamist mission was accomplished? Only another type of investigation will determine that,’ the author writes. “Anti-debt crusader Rand Paul has $301,108 in unpaid presidential campaign bills,” from the Lexington Herald-Leader: “…Sen. Rand Paul, a self-described fiscal conservative who calls debt ‘the greatest threat to our national security,’ has more than $300,000 in unpaid bills from his failed presidential run last winter. Rand Paul for President reported $301,108 in debts and $2,558 in cash [in a June FEC]. The campaign owes dozens of businesses and individuals … for rent, consulting … and expense reimbursements promised to campaign workers. Peter Kutrumanes said his company ‘just won’t do business’ with Paul again in the future...'We try to get payment up front. Unfortunately, in this particular case … we didn’t,' said Kutrumanes, whose company is owed $3,962." 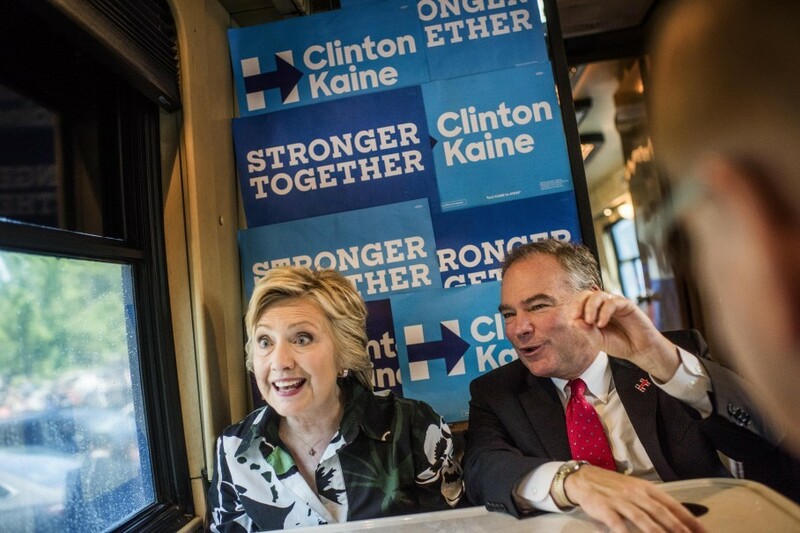 On the campaign trail: Trump is in Columbus and Harrisburg, Pa.; Pence stops in Carson City and Reno, Nev. Clinton is in Omaha; Kaine is in Richmond. At the White House: Obama travels to Atlanta to speak at the 95th National Convention of Disabled American Veterans and participate in a DNC roundtable. 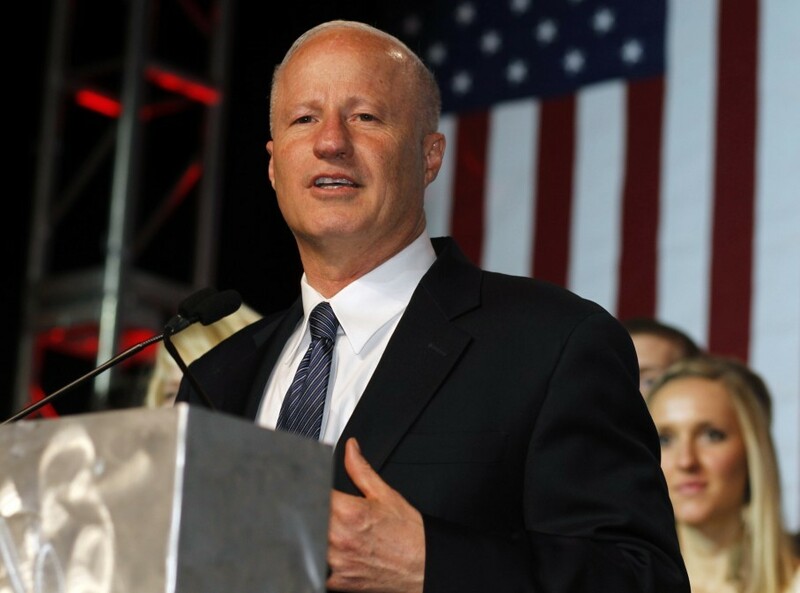 QUOTE OF THE DAY: “Having served in Iraq, I’m deeply offended when Donald Trump fails to honor the sacrifices of all of our brave soldiers who were lost in that war," said Colorado Republican Rep. Mike Coffman, who served in combat as a Marine and represents a swing House district. -- The Nationals lost to the Giants 3-1.